How tall is the London Eye? Who opened Britain's first Indian restaurant? Who was the fifth wife of Henry VIII? If Meghan Markle doesn't already know the answers, she needs to start studying. All three are potential questions on a test given to those who - like Prince Harry's fiancee - want to become British citizens. Immigration lawyer Colin Yeo says the road to British citizenship is "insanely complex." "It's very easy to make mistakes because the requirements are so very precise," he said. Britain's royal family has become a lot more welcoming to American divorcees since the last time one tried to join the clan. When King Edward VIII wanted to marry twice-divorced Wallis Simpson, it sparked a constitutional crisis. The king abdicated in 1936, saying he could not reign "without the help and support of the woman I love." Britain's Conservative government tightened immigration rules in 2012 to help it meet a self-imposed target of reducing net immigration to less than 100,000 people a year. (It's currently over 200,000). The target was set at a time when public attitudes to immigration were hardening. A desire to cut immigration was a major factor for many in the U.K. who voted in 2016 for Britain to leave the European Union. But critics say the immigration rules are rigid and unfair, giving the affluent an advantage over the less well-off. Non-EU citizens who marry Britons typically must obtain a spousal visa, then live in the UK for five years before they can apply for permanent-resident status or citizenship. She also must show that Harry earns at least 18,600 pounds ($26,000) a year or has 62,500 pounds ($87,100) in savings, and can provide accommodation "without recourse to public funds." One thing Markle will find it hard to avoid is the "Life in the UK" test, a notoriously quirky set of questions covering everything from history and literature to customs and politics. The test has been criticised for containing questions that few Britons can answer. The House of Lords Citizenship Committee said last week that the quiz appeared to be "a barrier to acquiring citizenship rather than a means of creating better citizens." Law professor Thom Brooks, author of "Becoming British: U.K. 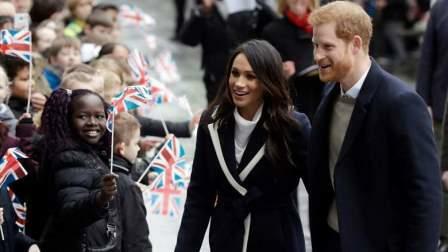 Citizenship Examined," advises Markle to learn the height of the London Eye Ferris wheel (443 feet or 135 meters), the name of the pioneering Indian restaurateur (Sake Dean Mahomed) and the identity of Henry VIII's six wives to prepare for the test.